For century-old Stanco, an 1100-ton link-motion press forms new opportunities. ...of Decimal Engineering, Inc., a Florida stamper and fabricator boasting inhouse capabilities that take customer projects from start to finish. 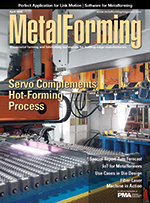 MetalForming picks the collective brains of experts to learn how IoT technology promises to change the metalforming landscape, leading to mistake-proof production and sky-high efficiency. Make plans to attend METALFORM and Machining Mexico, co-located with FABTECH Mexico, AWS Weldmex and COATech. Sales have leveled off while high-ticket demand remains high. Watch for coming innovations. A new model yields results that should continue the trend of AHSS as the fastest growing material in automotive applications.